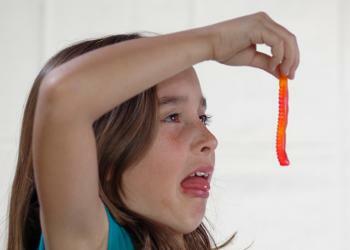 Use gummy worms for a Gross Food Challenge. Survivor party games are easy to put together, especially for fans of the popular reality TV show. The show features challenges for the contestants in every episode, and many of them can be adapted for fun party games for all ages. Puzzles - Almost every episode of Survivor features a challenge that involves some sort of puzzle. From racing through water to dive for bags of puzzle pieces, to building staircases out of giant puzzle pieces, puzzles are always prominent. Endurance - Simple games of endurance that get more difficult as time passes are very popular. Head to Head Battles - Even in team play, team members will take turns in battles of strength and skill. If you want to make the party games really authentic, have the party host dress up as Survivor host Jeff Probst, who normally wears khaki shorts and a button-down shirt. Learn the standard phrases from the show, such as kicking off challenges with, "Survivors, ready? Go!" On the show, Survivor contestants are divided into two or three tribes to start things off. These ideas include games for team play as well as individual competition. Set up two identical obstacle courses, and place bags containing puzzle pieces at the end of each course. The object is for teams to run the obstacle course, one at a time, retrieving a bag of puzzle pieces and returning to the start, where the next person begins the obstacle course. Once all team members have brought back a bag, the bags can be opened and the puzzle must be completed. The first team to complete the puzzle correctly wins. One of the classic challenges on the show is the Gross Food Challenge. Contestants are required to eat some truly disgusting foods, and failure to do so gives the opposing tribe a point. Three points wins the challenge. You don't have to serve actual "gross food" for this game, especially if the party is for kids. Use gummy worms, candy bugs, boiled eggs for "eyeballs," and other regular food items instead. You can change up the rules a little bit as well, so that whoever finishes his or her item the fastest wins. This game takes a little bit of effort to set up, but it's an authentic game that Survivor fans will enjoy. Set up large pieces of cardboard with each guest's name in big, bold letters in the middle. Attach three to five inflated balloons to each board, and hang them up outside against a fence or wall. Prepare a series of Survivor trivia questions. The host will ask the questions and require all guests to answer on a small card or piece of paper. Whoever gets the right answer gets to pop a balloon from someone else's board. When all the balloons on someone's board have been popped, he or she is out of the game. Trivia questions continue until only one person has any balloons intact on his or her board. Scavenger Hunt - Have your guests search for hidden Immunity Idols that you have made and hidden around the house or yard. Tribal Flags - Divide the guests into two or more groups, and ask them to come up with a name for their tribe. Provide paper banners, paints, and markers so the tribes can design their flags. Tribal Council - At the end of the party, instead of voting anyone out, have the guests sit in a semi-circle and pull their names out of a bucket. As their names are read, they get to come up and collect their loot bags or party favors, or you can pick up special prizes and award them for things like, "most energy," or "most helpful." Just make sure that everyone gets an award. Survivor games for a party can be really creative and fun. Simply watch a few episodes of the show, or go to CBS.com to see clips from challenges. Let them inspire you to create simple or complex games for your themed party.